Has Yemen war handed Aden to jihadists? Unseen by most of the world, the once tranquil port of Aden is being steadily infiltrated by jihadists from both al-Qaeda in the Arabian Peninsular (AQAP) and the so-called Islamic State (IS). They are not in charge of the city, the military forces of the UAE are. But in the last few days disturbing reports have emerged of the summary executions of prisoners by the jihadists, along with their black flags hoisted onto public buildings. The war in Yemen, now in its sixth month, has effectively offered the jihadists a backdoor entry into the country's second most important city and a major Indian Ocean port. "The jihadists have been taking advantage of the chaos in Aden to infiltrate the city," says Aimen Deen, a Dubai-based consultant and former jihadist himself. Nigel Inkster, the director of transnational threats at the London think-tank IISS and a former director of Britain's Secret Intelligence Service, concurs. "AQAP are a very opportunistic organisation," he says. "What has happened in Aden has created an opportunity and given them scope to expand there and in certain parts of the country." 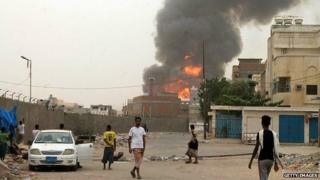 So what exactly has happened in Aden? Very bad things in recent weeks is the answer. For 128 years, the Indian Ocean port of Aden and the adjoining hinterland was a British protectorate and later a crown colony. As recently as the 1960s, cruise ships were dropping off passengers to shop in its teeming markets as they refuelled on the long voyage between Southampton and the Far East. It was one of the busiest ports and harbours in the world. After a violent independence campaign, Aden became the capital of the Marxist People's Democratic Republic of Yemen from 1967 to 1990. Russian sailors strolled around town, office women wore Western skirts and there was even a local brewery. Then followed unification with North Yemen and a brief and ultimately unsuccessful attempt by the South to split away in 1994. When I interviewed the country's strongman, President Ali Abdullah Saleh, in 2000, he told me his greatest achievement had been uniting the two Yemens, North and South. But today Yemen is in chaos. Pushed out by the Arab Spring protests of 2011, President Saleh left office, but not Yemen. A sore loser, he conspired to wreck Yemen's transition to a peaceful democracy, forming an alliance in 2014 with the same Houthi rebels he had fought several wars against. In September 2014, the rebels advanced on the capital, Sanaa, from their northern stronghold. By January 2015, they had the president, Abdrabbuh Mansour Hadi, under house arrest. By March, they had seized almost the whole of the western half of the country, driving the government into exile and capturing Aden. Who is fighting whom in Yemen? Houthis - The Zaidi Shia Muslim rebels from the north overran Sanaa last year and then expanded their control. They want to replace Abdrabbuh Mansour Hadi, whose government they say is corrupt. The US alleges Iran is providing military assistance to the rebels. Ali Abdullah Saleh - Military units loyal to the former president - forced to hand over power in 2011 after mass protests - are fighting alongside the Houthis. Abdrabbuh Mansour Hadi - The president fled abroad in March as the rebels advanced on Aden, where he had taken refuge in February. Sunni Muslim tribesmen and Southern separatists have formed militia to fight the rebels. Saudi-led coalition - A US-backed coalition of nine, mostly Sunni Arab states, says it is seeking to "defend the legitimate government" of Mr Hadi. Al-Qaeda in the Arabian Peninsula - AQAP opposes both the Houthis and President Hadi. A rival affiliate of Islamic State has also recently emerged. Yemen's giant neighbour, Saudi Arabia, suspected the hand of Iran was behind the rebels, who are Shia, and launched a devastating air war to push them back and force them to sue for peace. It has largely worked, but at a cost. The rebels are now in full retreat, but over 4,000 people have been killed in the fighting, at least half of them civilians. The once quiet, torpid streets of Aden have been battered by mortar fire, snipers and artillery. As part of the Saudi-led coalition, the UAE landed an entire armoured brigade there to reinforce the Yemeni loyalists fighting the rebels. French-built Leclerc tanks of the UAE army have been in action north of the city. But in Aden itself there has been something of a power vacuum with almost no effective policing or security - just the sort of situation the jihadists like to exploit. As far back as February, when the Houthis were advancing into Aden, IS declared a new province, a "wilaya" of Aden and Lahej. After launching an attack on Houthi rebels on 18 July, they reportedly executed seven of their captives in the district known as Crater. Now, in a new report on the mistreatment of prisoners by both sides, Human Rights Watch cites reports that on 23 August, IS dressed a number of Houthi prisoners in orange jumpsuits, placed them in a boat which was then towed out into the harbour. Reportedly watched by local residents of Aden, the boat carrying the prisoners was then blown up, killing those on board, the report says. Yemen is no stranger to violence. In the last four years, it has witnessed some horrific suicide bombings, mostly in Sanaa. For now, it seems that the jihadists of AQAP and IS have largely put aside their differences to fight their common enemy, the Shia Houthi rebels. Ironically, they are being aided by air strikes from the very countries - Saudi Arabia and the UAE - who normally oppose them. But their apparent infiltration into what was once one of the most important ports on the Indian Ocean gives them a base they could only have dreamed of before this war began.